To improve maternal health requires action to ensure quality maternal health care for all women and girls, and to guarantee access to care for those outside the system. 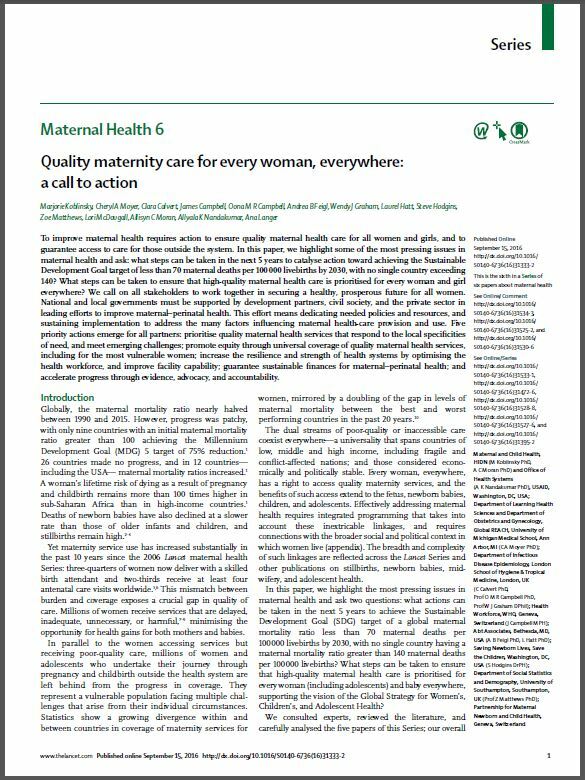 In this paper, we highlight some of the most pressing issues in maternal health and ask: what steps can be taken in the next 5 years to catalyse action toward achieving the Sustainable Development Goal target of less than 70 maternal deaths per 100,000 livebirths by 2030, with no single country exceeding 140? What steps can be taken to ensure that high-quality maternal health care is prioritised for every woman and girl everywhere? We call on all stakeholders to work together in securing a healthy, prosperous future for all women. National and local governments must be supported by development partners, civil society, and the private sector in leading efforts to improve maternal–perinatal health. This effort means dedicating needed policies and resources, and sustaining implementation to address the many factors influencing maternal health-care provision and use. Five priority actions emerge for all partners: prioritise quality maternal health services that respond to the local specificities of need, and meet emerging challenges; promote equity through universal coverage of quality maternal health services, including for the most vulnerable women; increase the resilience and strength of health systems by optimising the health workforce, and improve facility capability; guarantee sustainable finances for maternal–perinatal health; and accelerate progress through evidence, advocacy, and accountability.